I was born in Ankara, Turkey, the daughter of an US Army Air Corps P-51 fighter pilot and a US Army nurse, who met and married while serving in WW2 in the North African Campaign. When I was less than two years old, my parents, three older sisters and I sailed by ship back to the US where we lived on the east coast from Canada, New York, Delaware to Georgia. Being an ‘Air Force brat’ meant moving around a lot. As a young child, singing and being out in nature provided me with a means for maintaining balance in an otherwise constantly changing living environment. In high school, my interests expanded to psychology, philosophy, and spirituality, as I would read Hesse, Ouspensky and J. Krishnamurti in preference to my schoolbooks. My 45-year study of yoga began at age 18 under the mentorship of Swami Satchidananda at his Pomfret Center in Connecticut, his first ashram in America. Asana (posture) practice was only one of the 8 limbs of yoga I studied with this great yoga master. The experience of sitting for satsang, practicing pranayama, and early morning meditations with Satchidananda set me on my path to be a yogi. We did not dwell heavily on the asana or physical aspects of yoga at the ashram. We instead were on a quest to become centered and eventually enlightened. I entered college and studied psychology for 2 years but then decided to leave school and travel to see more of the world and find out more about myself. I felt drawn to learn and have experiences not available in the world of books and linear thought. I left the east coast and drove across country by myself in a 1966 VW Bug seeing the great west and then heading for San Francisco. I sold the bug and headed down to Mexico and Central America for six months. Traveling south of the border provided valuable insights on the meaning of life and the cultivation of compassion for self and others. I gained a real appreciation for the wealth and opportunities available to us as Americans while paradoxically seeing that many will spend their youth and health trying to make wealth and then spend their wealth in later years trying to regain their health back. I saw the need for a real solution that would instead give people tools to ‘live long and die short’. I returned to the US and headed north to explore Alaska, working when I needed money while continuing my daily yoga practice which included the poses, meditation, pranayama (breathing exercises) and the study of yoga philosophy. Leaving Alaska, I moved first to Wyoming and then later to Montana, where I spent the rest of my twenties. There were no yoga teachers or studios in Montana, so during that time, I studied on my own using Iyengar’s book Light on Yoga. I devoured the writings of Yogananda and was initiated into Transcendental Meditation. While living in the northwest, I was fortunate to acquire a surveying job where I was paid to spend my time hiking around in the backcountry. My days were free to be in nature and I got up early before work to practice yoga asana on my own. Yoga was not very popular then and my co-workers considered me a weirdo. While they chewed tobacco, drank beer and smoked pot in their free time, I practiced asana, pranayama and meditation. I was the odd duck and it NEVER occurred to me at that time that yoga would someday become mainstream! In the evenings, I sang and played guitar until I became proficient enough to quit the surveying job and earn my living as a professional musician. 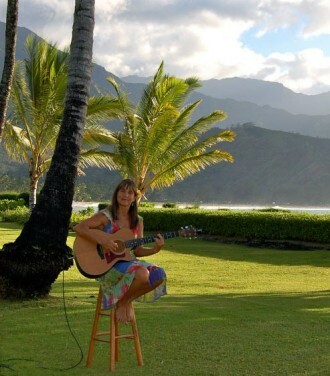 After a few years ‘on the road’ playing both solo and band gigs, I took a vacation with friends to Hawaii, where I was offered a full time job playing music. So I left Montana, moved to Kauai in 1983, married, started a family and a retail business. 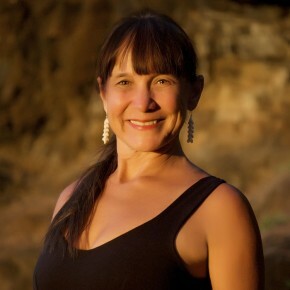 When my son was one year old, I found a yoga teacher on Kauai and began to go to Ashtanga yoga classes as well as a home practice. I continued doing this intense vinyasa style for about two years until I was injured. One day while practicing a standing one leg forward bend while in half lotus, I felt a sharp pain in my lateral collateral knee ligament area. For almost a year I was forced to stop running and I had to drop many yoga poses so I could let my knee heal. I meditated, kept a journal and attended massage school, which led to me starting yet another career as a licensed massage therapist. Although I recommended yoga to many of my massage clients, most said they could not do yoga because “they were not good at it” or that “it hurt”. When my knee finally healed I began to experience pain in other parts of my body – such as in my hip and groin when I did triangle poses and in my neck after plow or shoulder stand pose. My athletic body was becoming unstable and I noticed that I felt better after missing practice for a few days and after the ashtanga classes, rather than having a lot of energy, I felt sore and exhausted for the rest of the day. I stopped doing Ashtanga and decided to begin teacher training in the Iyengar method. Soon afterward, however, I realized that my body was feeling sore from this practice as well. My heart and my body were clearly telling me to do something very different than Iyengar style yoga. Eventually, I earned a teacher certification with Erich Schifmman, yoga master and author of Moving Into Stillness. He was the only yoga teacher who ever honored my way of doing asana and encouraged me to listen to inner guidance or as he called it, the ‘traffic helicopter’. Freed from the constraints of a specific style, my yoga practice was now guided more by my body than a set of scripted poses. I was careful to avoid poses and movements that caused strain anywhere in my body, or compressed the freedom of my diaphragm. I added proven elements of self-massage to my practice, and in a similar physical therapy paradigm focused on improved movement, I devised ways to keep the spine aligned as though I was in motion, rather than holding static positions as I had been trained. I began to feel like I was ‘floating’ after each session and my body stopped hurting. I poured over anatomy books and discovered one called The Endless Web, which described the role of fascia as the matrix that connects our body into one seamless whole. The body is not made of parts but instead is a continuum where all movements reverberate throughout the entire body. I analyzed the function of yoga poses and questioned each movement in the context of the way our bodies are designed to move naturally. I realized that many yoga poses are linear, or beyond linear, neither being natural for our curved human design. There seemed to be no ‘right’ way to do them in ways that would honor the global nature of our structure. After thousands of hours of study and years of working with students and clients’ injuries, pain and misalignment, I gave the practice a name – YogAlign. 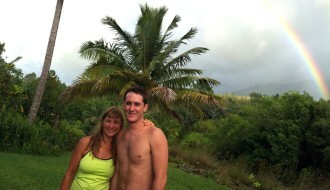 I have lived on Kauai for over 30 years now and raised my son Zack who is now in his twenties. I have continued to enjoy singing and playing guitar mostly for friends and students. Music is the language of the soul and I feel it has been one of the influences that helped me to create the unique aspects of YogAlign. I also participate in many sports and activities including surfing, swimming, dancing, sailing, trail running and farming. 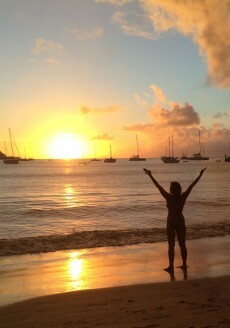 I feel grateful to have meaningful work sharing my gift of YogAlign all over the globe. One of my greatest joys is watching people transform and get their life back as they gain the self-help tools to be aligned, youthful and pain-free.